Uma Talreja, Chief Digital Officer of Raymond Ltd.
Uma Talreja is the key architect for the digital roadmap for Raymond Ltd., a 91-year old legacy brand that has created the men’s clothing market with its fine fabrics proposition. 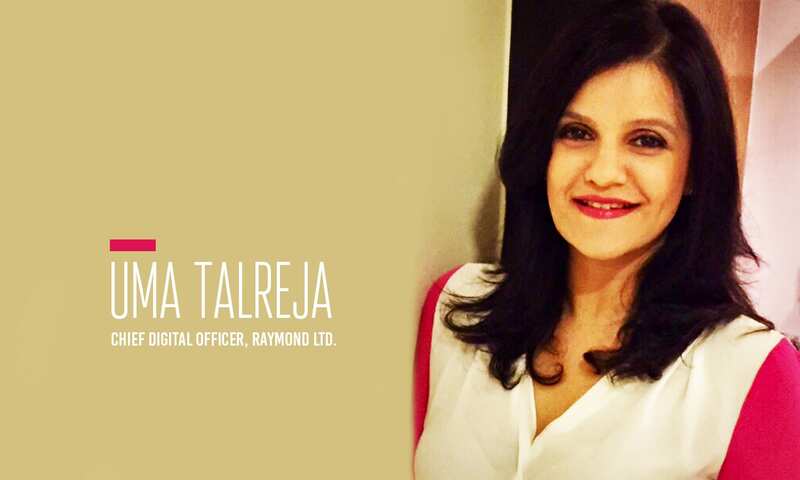 With 20 years of experience in marketing under her belt, especially in the formative years of the retail industry in India, Talreja has been a part of strategic teams at leading Indian retailers like Shoppers Stop, Aditya Birla Retail, and Tata-Trent (Westside department stores). Talreja also launched Burger King in India before joining Raymond. Her passion for customer centricity and creating retail experiences for consumers helps her lead Raymond’s efforts on strategy for consumers, including the Ecommerce business, Omni Channel Strategy, technology and roll out, CRM and integrated customer analytics. Besides, she reflects a strong alignment to data driven marketing. She has led the launch of a unified customer loyalty program at Raymond cutting across brands at Raymond. This program contributes close to 70% of revenue with more that 4.5 million consumers. The company has won more than 20 awards for digital marketing and data driven marketing in a short span of under a year. Analytics India Magazine interacted with Uma Talreja, the Chief Digital Officer for Raymond Ltd. to find out how the company is making use of analytics across the textile industry. Analytics India Magazine: What is Raymond’s strategy towards spurring the adoption of data analytics and related technologies? Uma Talreja: Companies struggle with volumes of data and money spent on sourcing, storing, and managing huge volumes of data. Unfortunately, they also struggle to keep up with the value and monetization of data. When it comes to using Big Data, the adage of ‘dream big and smart’ holds truer than ever. Our strategy is to put the customer at the heart of the business; and marry customer views, product views, and other views like channels and feedback. This helps towards improving product, services, and marketing decisions. It is important to build a strategy towards finding value out of data. At Raymond, we have started our data driven initiatives with customer-centered data; which includes their profile, purchase, and behaviors within our business. This acts as the first actionable data set which helps us improve our approach to serving customers. We use this for predictive modelling or for diagnostic possibilities, to address business challenges. AIM: Please tell us about how Raymond leverages analytics and data technologies to solve the impediments pertaining to the arena? Walk us through your job role at Raymond? UT: We created a center of excellence a little over a year ago called the Digital Customer Centre, and a new role of the Chief Digital Officer as a change agent to help our business operate successfully in the new data and digital led environments. The department holds and manages all data and currently has structured data of around 4.5 million consumers who have a relationship with Raymond. The DCC uses this data as the foundation for their plans. The same data is also utilized for segmentation, targeting, creating lookalikes to begin with, and supporting marketing campaigns across brands at Raymond. Combined with social data, or web analytics, we are able to address our strategies for personalization within websites and campaigns, much more confidently. We have created around 18 personas with different missions and priorities which form the foundation for our marketing approach, especially for online and direct marketing. AIM: Please present a case study where you helped your client solve a business challenge leveraging the potential of analytics. UT: Starting with a hypotheses is key. One of the interesting analysis I have been able to do in a previous role has been to understand the impact of price of an anchor product in the store. It was interesting to first determine the deeper value of this consumer, their adjacencies and Customer Lifetime Value (CLV). Looking wider, we found that there was an opportunity to improve margin and yet protect sales by analyzing next best products in the portfolio, as well as the competition portfolio. Another interesting example has been to answer the question of stickiness of a garment FIT in apparels. Contrary to popular trends and beliefs around what is said, we found customers switching to other FITS and even improving their purchases, with of course an improved FIT being introduced. Such diagnostics help businesses take bold decisions with much more confidence, besides assisting towards building data adoption as a key to decision making. 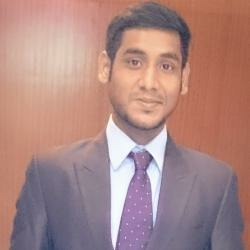 AIM: Talk about the challenges of integrating analytics within the textile arena. What are the current technological trends in terms of big data and analytics, that you would take note of? UT: I think the biggest strength is also the biggest gap we have. As the largest manufacturer of textiles, we distribute our products through the length and breadth of the country. However, we are able to track consumption only of the channels where we have our own point of sale. This is where culture of sharing data between us and our distribution nodes becomes important. It also stresses on the significance of technology as a bridge. An extended view of this consumption and consumers can help us create a seamless Raymond experience. The second challenge is around the variety of data that we can integrate. Here we are keenly exploring the sources of data we can integrate meaningfully and effectively, notably unstructured digital data. We are seeing machine learning and NLP as some key areas to explore for content creation, customer service, and also to help discovery of our products by consumers. AIM: How did you start your career in analytics? What fueled your ambition to enter this field? UT: You don’t have to be a data scientist to be an analyst, nor do you need to be a statistician. I often tell my team, you can be an analyst if you have two important qualities: curiosity and the ability to tell stories. Working in the retail industry for over 2 decades has been a big catalyst; coming in touch with many customers directly, being in a data rich environment, and using customer centric strategies every day. This creates a very enriching way of working and problem solving, with immediate gratification of the data used. AIM: Would you like leave any advice for all aspiring startups in the arena trying to make it big using data analytics? UT: My most frequently uttered advice to anyone is to be focused. You can be data rich and information poor quite easily, as you get lost in the quest to gather more and more data, and use less and less proportionately. It’s an ideal approach to prepare first for what you can put into action, before you gather more than you can apply, or have an idea of. AIM: What are some of the challenges you face in analytics space at Raymond? How do you tackle those challenges? UT: The task of integrating data across multiple brands and entities brings up challenges around different data formats, attributes, descriptions, and masters. We are tackling these one by one, and it requires multiple stakeholders and systems coming together, which we address in modules. As we start implementing our strategies around Omni-channel retailing, we are simultaneously preparing to ensure that our data can help us deliver a great experience for consumers. Also Read Interview of the week: Sanchita Sur, Founder and CEO at Emplay Inc.
Have Indian IT companies fully embraced disruptive technologies? Can Reinforcing ML And Graph Reasoning Make Chatbots Smarter?